Acai berries have been dubbed a "super fruit," with the media touting these berries as the key to the world's weight loss woes and the cure to a host of adverse health conditions. Despite these claims, scientists have not found conclusive evidence of these benefits. On the other hand, blueberries have been shown to be effective in reducing the activities of free radicals associated with common poor health conditions. 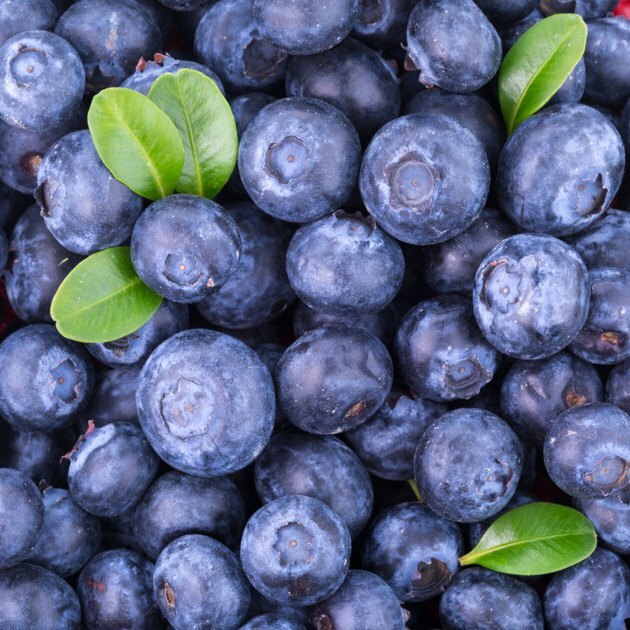 Blueberries and acai berries do share similar antioxidant properties and nutrient profiles, leaving you to wonder which of these should really be called a "super fruit." One cup of fresh, raw bluberries provides 84 calories, no fat, 21 grams of carbohydrates and 1 gram of protein. Carbohydrates include 4 grams of dietary fiber and 15 grams of sugar. The micronutrient content of 1 cup of blueberries is rich in two vitamins that are considered valuable antioxidants, vitamins C and E, providing 30 percent 8 percent of the RDA, respectively. Blueberries are rich in only one manganese, providing 20 percent of the RDA. One cup of exotic acai berries provides 125 calories, 2.4 grams of fat, 28.8 grams of carbohydrates and 0.8 grams of protein. Like blueberries, acai berries have 4 grams of dietary fiber but contain a bit more sugar, with 20.8 grams per cup. The micronutrient profile of acai berries is very rich, including 12.5 percent of the RDA for vitamins B12, B6, thiamin and riboflavin, and 25 percent of the RDA for vitamin C. The mineral content, much like that of blueberries, is limited. Acai berries contain only 12.5 percent of the RDA of folate. Blueberries, although not deemed a "super fruit," are also rich in anthocyanidins. A 2005 study in "Nutritional Neuroscience" showed the antioxidants in blueberries to enhance the learning and memory in rats. Blueberries have also been shown to be effective in fighting free radicals associated with cardiovascular diseases and tumor growth. Acai berries are considered a super fruit. In 2006, the "Journal of Agriculture and Food Chemistry" published a review of the nutrient composition of acai berries. Not only did they learn about the basic macro- and micronutrients, but they also discovered that acai berries contain a significant proportion of powerful antioxidants known as anthocyanidins, proanthocyanidins and flavonoids. This combination of antioxidants links acai berries to the ability to impact adverse health conditons like arthritis, cancer, high cholesterol and even weight loss. However, no conclusive studies currently exist. What are the Benefits of Taking Acai Berry Supplements?